The addition of the Metrotile granular galvanised steel pantile profile roof tiles transforms the LidgetCompton Pent garage range. By adding another dimension to the front elevation, the LidgetCompton Pent Mansard roof adds kerb appeal and is available in a choice of six colours. This is in addition to the unique C Section galvanised steel rafters for greater strength and rigidity. Galvanised steel one piece roof sheets means no joins, so no leaks and anti condensation treatment ensures best performance. The Hörmann fully retractable, fully pre-framed door ensures perfect fitting every time. The LidgetCompton bespoke options allow you to personalise your building. Spar, Brick or Stone effect panels, site applied Textured finish, RealBrick front posts and the full range of bespoke options ensure that you can choose the right building for your house, which will enhance its value, minimise insurance costs, and maximise kerb appeal. This building is on display at our Hertford branch, ( just check the 'where can I see one ' section on this page to find out which of our 33 branches has the building you are looking for on show ). It's in the brick effect finish and has white guttering and downpipes front and rear, 'Bronze' Metrotiles on the front roof, a Georgian unglazed door on the LH side and a 4ft wide opening double glazed PVCu window. The main door has been upgraded to Georgian style as well. It's a great example of many of the features you can specify to personalise your garage. This Mansard features a number of additional options such as the dark brown, vertically ribbed main door and the rosewood facias and side door. There's a window in the rear of the building too. The building also has real brick front posts and bronze Metrotiles on the front section of roof. This Double Pent Mansard is 16ft6 wide and 16ft3 deep. It's fitted with our 'Premium Options' package which include the Georgian style front doors and personnel door amongst other features. 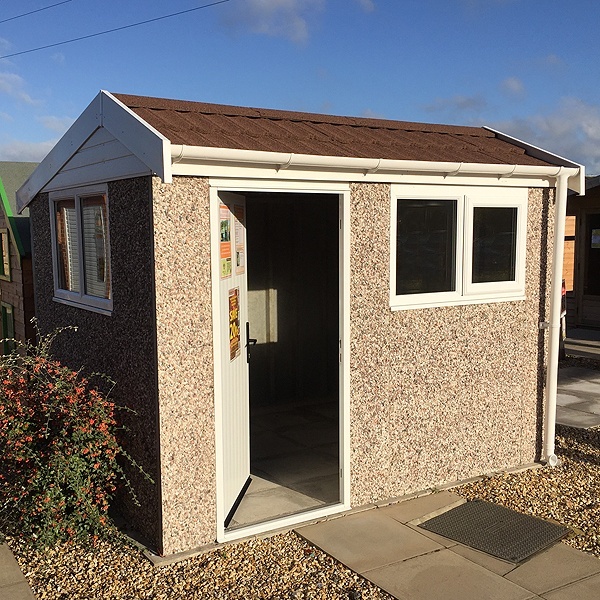 As with all of our Lidget Compton garages, there's a huge ranges of sizes and styles to choose from so please give us a call to determine which is the appropriate garage to accommodate your needs. 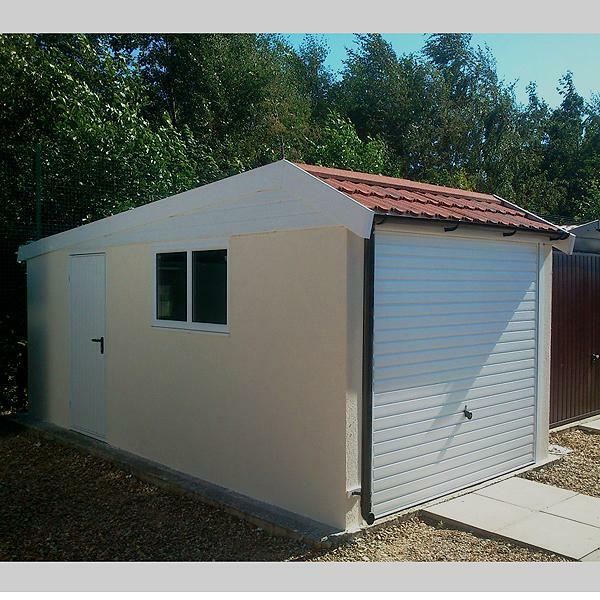 This is a useful way of blending your garage in to the surrounding property or countryside. A textured finish is applied to the concrete panels after installation which you can then paint to a colour of your choice. 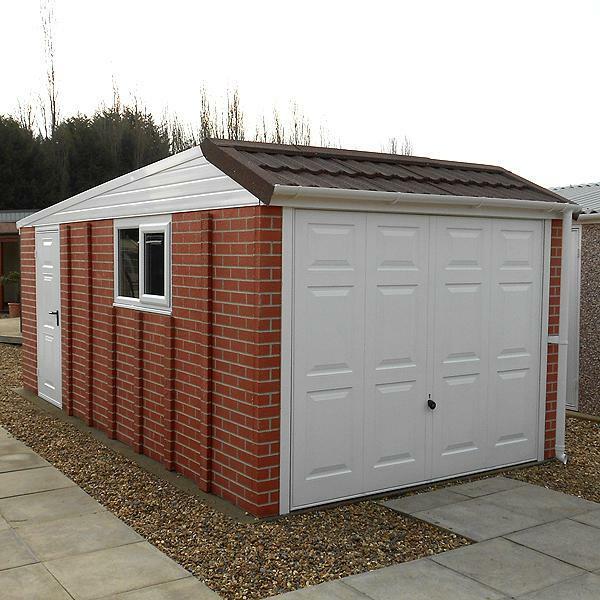 This is a popular alternative to the brick or Spar finish garages. This is a display building from our Ferndown branch of GBC. It is a Spar finish Mansard garage with brick front posts, black guttering and downpipes front and rear, and the 'Charcoal' coloured Metrotiles on the front roof section. The front door is Georgian style and there's a half glazed white PVCu personnel door on the LH side. Maintenance free PVCu vergeboards and facias are standard features of the Pent Mansard range. Another view of the Hertford display building which shows the Grafotherm, anti-condensation roof sheets, the rear guttering and some more detail of the maintenance free vergeboards and facias. The Georgian side door is shown more clearly too. Most of our garage types can be specified as sheds too : here the Pent Mansard shape is utilized in this high spec concrete shed. Metrotile roof and PVCu windows and facias are standard ( there's one extra window fitted ). 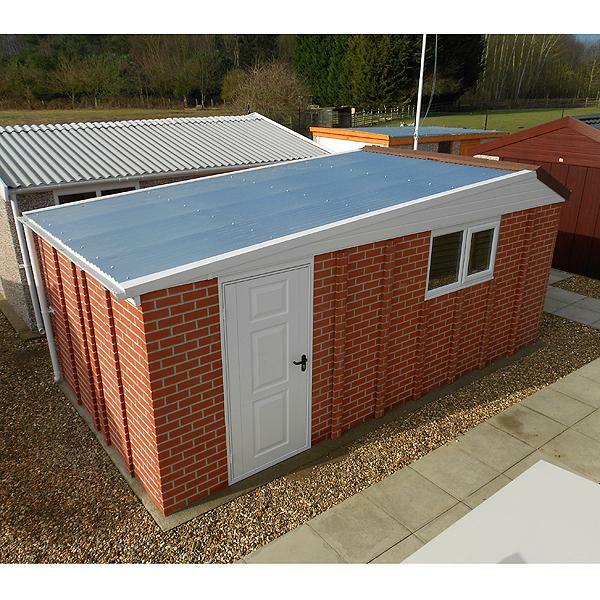 The vertically ribbed galvanised steel door ( not up-and-over on sheds ) has been specified to open inwards. Installation on our customers' suitably prepared bases is included for all of our LidgetCompton garages. In the foreground you'll see the full length galvanised steel roof sheets we use on our Pent and Pent Mansard garages. These are treated with Grafo-therm anti condensation treatment to help protect the contents of your garage from damp.They are robust, long lasting and secure. 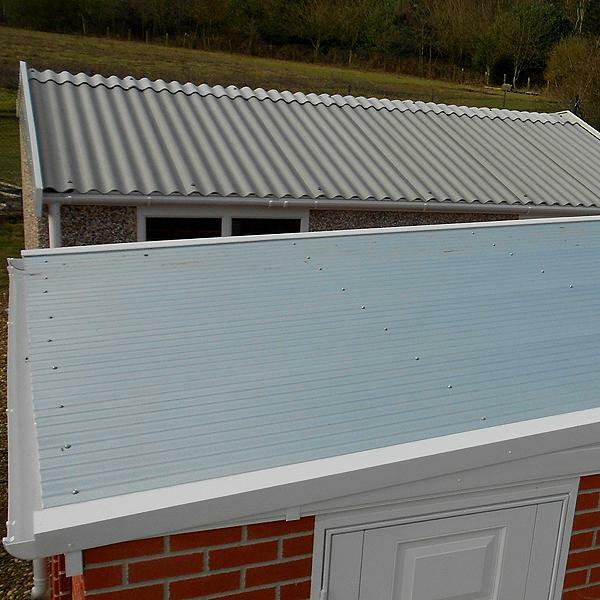 In the background you'll see the fibre cement roof sheets which are used on our full range of 12.5 degree roof Apex models... our best selling buildings. These have a proven track record and are water tight and durable. There are four choices for the exterior walls of your Compton Lidget Garage. The most popular is the spar aggregate finish pictured here. It's an attractive, inexpensive and maintenance free finish which is applied at the factory during manufacturing. Alternatively you can choose a brick finish, stone finish, or a textured finish. 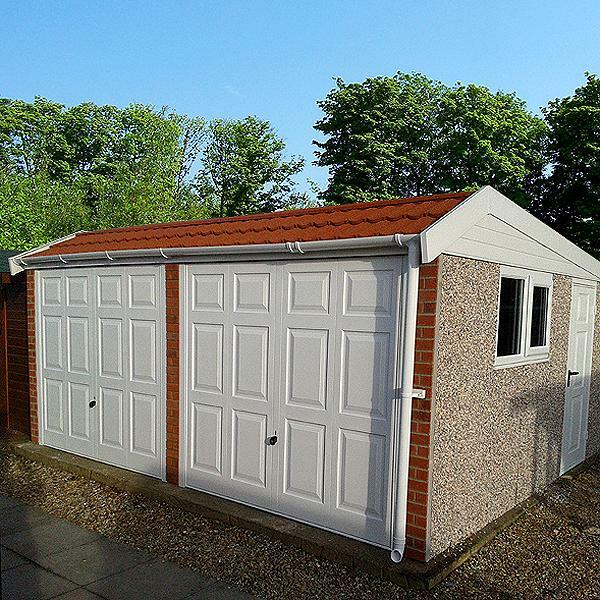 There's a choice of four wall finishes for your Lidget Compton garage. Illustrated here is the Sectional Brick finish. Other choices are the Spar aggregate, Stone or Textured finishes. There are 4 different sectional brick colours to choose from .. this one is 'Deep Red' but we also have a buff brick, brown brick and a different shade of red available. Our display centre staff can help you decide which one is most appropriate for your location ! This stone finish is one of the external finishes available with your Lidget Compton garage. 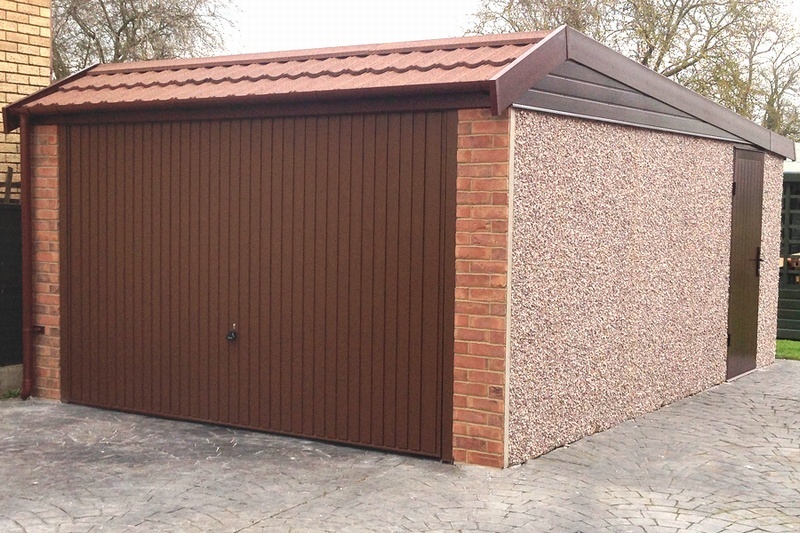 In the appropriate location the Cotswold finish helps your sectional garage, shed or garden room blend into its surroundings with ease. This building has decograin Rosewood finish on the front up and over door and door frame. Cotswold stone effect finish. This stone finish is one of the external finishes available with your Lidget Compton garage. Shown here only on the front posts, it can also be specified on the whole garage in a similar manner to the Pennine finish also pictured. A handy addition for your concrete garage which attaches using sturdy metal brackets bolted to the concrete panels. No need to attempt to drill into the garage panels yourself ( which we definately don't recommend ). Personnel door , 3ft ribbed steel. This is the optional 3ft personnel door, available for any of our range. This one is in vertically ribbed steel and is finished with a white powder coated paint finish. There's a choice of different styles too so please be sure to ask about other options. Personnel door , 3ft ribbed steel, interior. The internal door handles on our steel personnel door are substantial and easy to hold. This particular door has additional security with two point locking as well as the normal lock. Personnel door , 3ft deluxe timber. This is the optional 3ft personnel door, available for any of our range. This one is our deluxe treated timber door and is finished with a quality wood preserver. There's a choice of different styles too so please be sure to ask about other options. An interior shot of the deluxe wooden door shown here on a Pent roof garage. Even in this application there's room to fit the door under the up and over lifting gear. Normally you would expect to position this door further down one side or at the rear. Note that the door is strongly framed and includes a secure lock. This is the internal view of the 3ft vertically ribbed, white powder coated personnel door available with most of our sheds and garages. Our main garage doors have two point locking but for a small extra charge you can upgrade to 4 point locking. ( Note the bars that run diagonally across the door ). This locks the door in all 4 corners. Making your garage weathertight is very important and two of the key elements of this are shown in this picture. When installed, your garage fitters will seal between the panels with a water resistant mastic sealant which prevents draughts and damp. 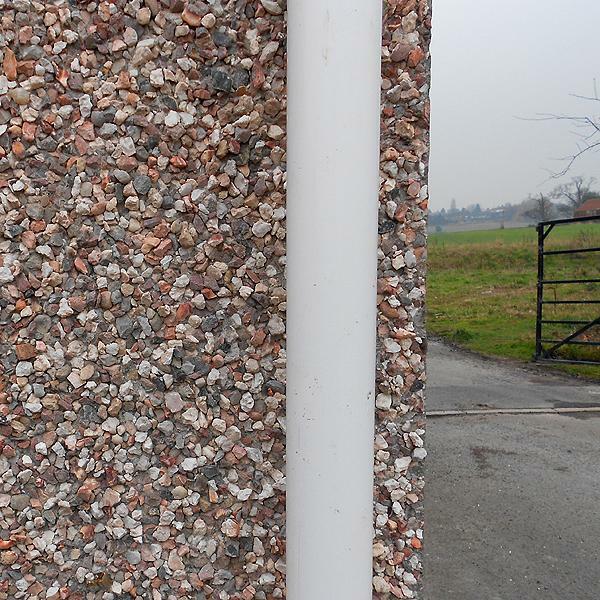 If you choose the option of a sand/cement fillet the fitters will fill and smooth around the bottom edge as shown in the picture with a cement fillet. The extra height gained from the addition of the Mansard roof is well illustrated in this picture. You can also see the sturdy galvanised steel C section rafters which add strength and stability to the structure. There's a 4ft fixed PVCu window included with the Pent Mansard but this one has been converted to an opening window. The front door has been upgraded to Georgian style and 4 point locking too ! This up and over door is a 'sectional door'... look closely and you can see it is made up of four horizontal panels, one of which can, if wanted,accomodate 'waterford inserts' ie glazed panels ! Because of the door construction you can to park up closer to the door and yet still be able to lift it as it folds upwards while retaining its overall size. 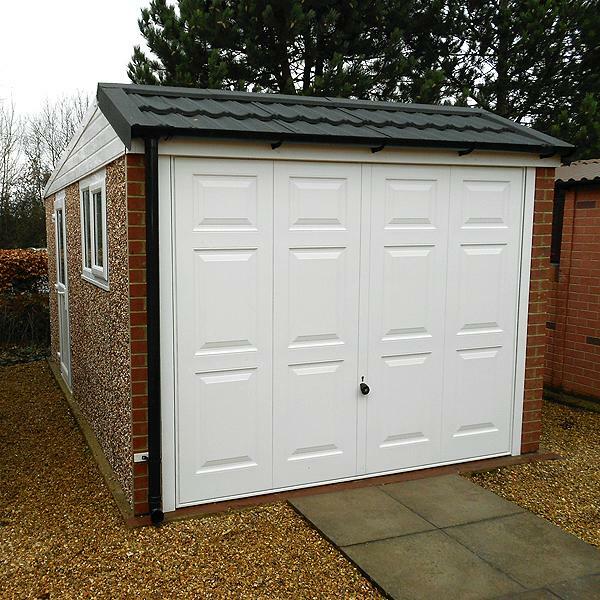 This sectional door is shown on an Apex 20 garage but can be fitted to all of our garage styles. If you want to see one of these doors we have it on show at our Ferndown branch in Dorset. Just check out the address on our site locator or follow the 'where can I see one link' above. This is our 'sectional up and over door' from the inside. The picture illustrates how it folds when being lifted.